Pastry can be made in advance and stored in the freezer. Defrost overnight in the fridge and use as required in recipes. You could add a little freshly grated nutmeg to the onion mixture – it taste great. To make the pastry: In a large bowl sift together the flour and salt. Rub in the butter until the mixture resembles fine breadcrumbs. Add the egg yolk and enough water to make a firm dough. Turn out onto a lightly floured surface and knead until smooth. Roll out and use to line four 10cm tartlet tins. Prick the bases with a fork and chill whilst preparing the filling. To help with making pastry, see our step-by-step guide. Melt the butter and oil in a medium sized non-stick pan and add the onions and lemon juice. Sauté for 15 minutes until soft and slightly caramelised. Remove from the heat and set aside to cool. Preheat the oven to 200ºC/gas 6. Line each tartlet with baking parchment filled with baking beans. Bake for 10-15 minutes. Remove the paper and beans and return to the oven for a further 5 minutes to dry out. Remove and cool slightly on a baking sheet. Increase the oven temperature to 230C/gas 8. 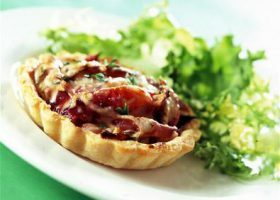 Mix the onions, half the parmesan, the crème fraîche and thyme leaves, season with salt and ground black pepper and divide evenly between the tartlet cases. Sprinkle over the remaining parmesan. Bake for 5-10 minutes until golden. Garnish with thyme leaves and serve warm or cold with a crisp green salad.